Re Fire the Zombies info about the game-Games2Rule. Now your job is to kill all the zombies which are going crazy in your city. 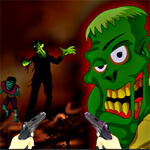 Survive for as long as possible by shooting the zombies without getting hurt. You upgrade your health with the coins at the end of each level.